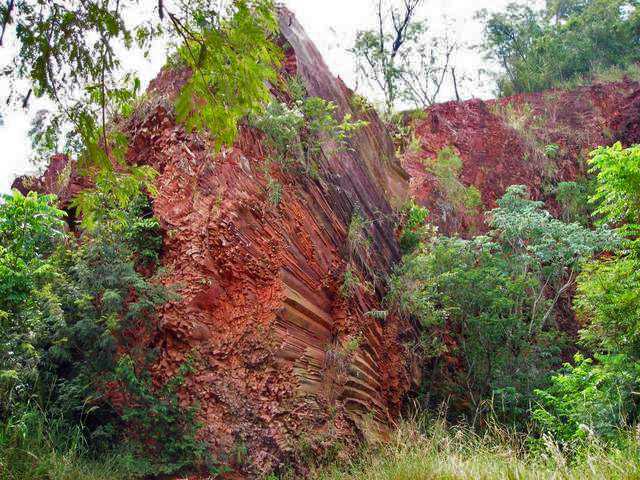 Below are listed the most amazing natural and man made landmarks of Paraguay. 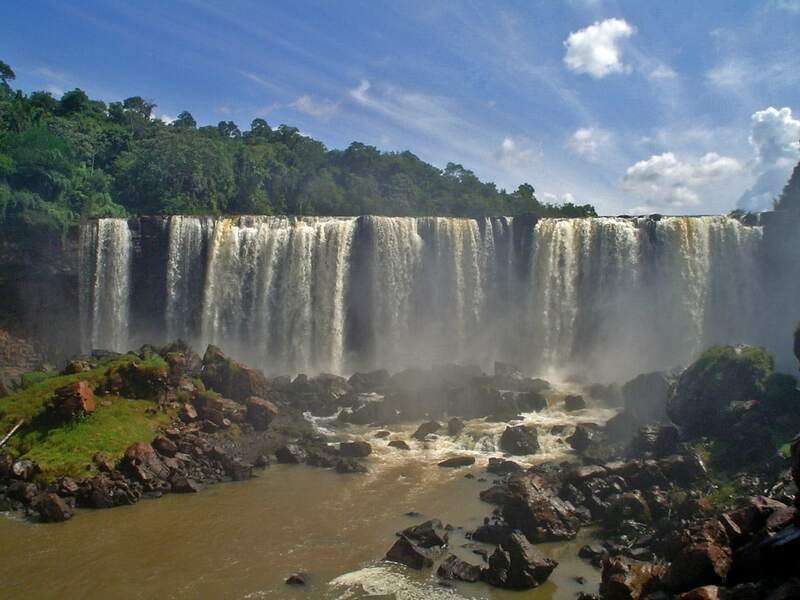 Aguaray Guazu Falls – Amambay. Free falling, 58 m tall waterfall. Carapa Falls – Guairá. Approximately 50 m tall cascade with numerous small steps, located in impressive jungle setting. Located in the primeval Mbaracayú Forest – remnant of Interior Atlantic Forest. Monday Falls – Alto Paraná. Waterfall on the powerful Monday River, approximately 45 m tall and 120 m wide. Nacunday Falls (Salto Ñacunday) – Alto Paraná. 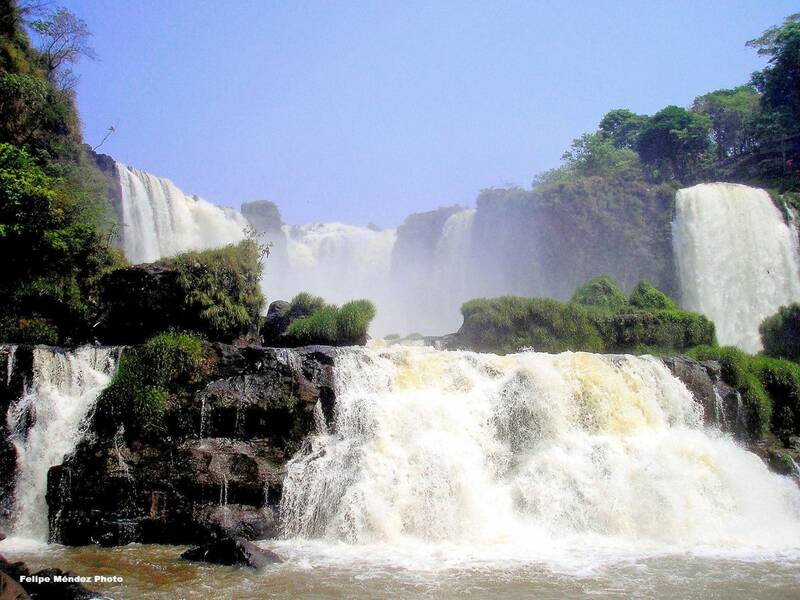 Magnificent waterfall – "Niagara of Paraguay". This waterfall is 40 m tall and 110 m wide and is located in scenic, forested area. Suizo Falls – Guairá. 62 m tall, free falling waterfall, the tallest in Paraguay. Caverna Kamba Hopo – Concepción. Impressive grotto – cave at the bank of Paraguay River. Cerro Koi and Cerro Chorori – Central. Sandstone outcrops, where the sandstone is fractured into hexagonal columns. Ojo del Mar – Amambay. Small lake in the middle of pristine forest. According to legends, this lake has no bottom and people should not swim here, otherwise some mysterious force would swallow them. San Lázaro Caves, Vallemí – Concepción. Group of interesting caves with stalactites and other cave formations. La Santísima Trinidad de Paraná – Itapúa. 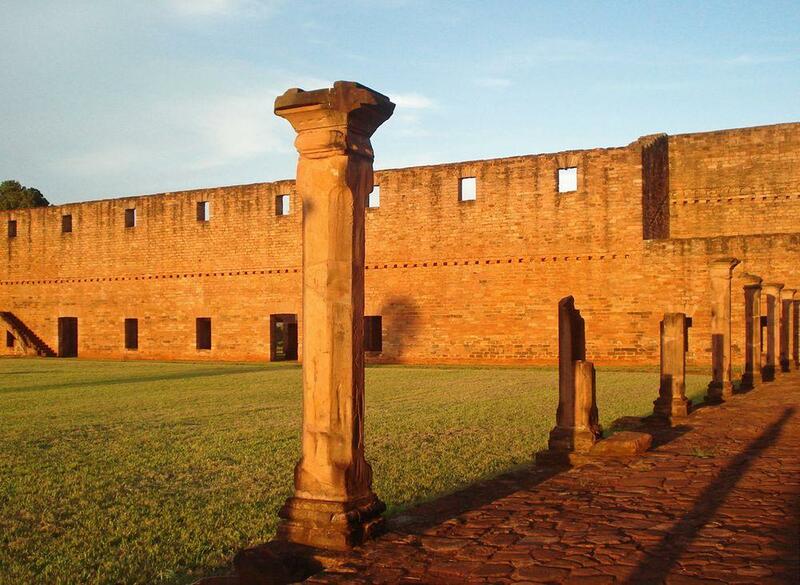 Ruins of the largest of the 8 historical Jesuit missions in Paraguay, a regional capital. This mission was built in 1706 and had a nice church with rich decoration and a complex of other buildings. Mision de Jesús de Tavarangué – Itapúa. Ruins of Jesuit mission, moved to its present site sometimes around 1690. Santos Cosme y Damián Jesuit mission – Itapúa. Ruins of an unfinished church and several more buildings of Jesuitic mission, which was moved to the present location in 1740. Church is in current use. Cerro Acuá petroglyph site – Amambay. A prehistoric petroglyph site where, as it seems, are depicted male and female genitalia. In Cerro Corá National Park are located many other sites with prehistoric petroglyphs. Fernández rock shelter – Guairá. Prehistoric rock shelter with petroglyphs. Gasory rock shelter – Amambay. Prehistoric rock shelter with petroglyphs, which resemble mysterious writings. Ita Letrá – Guairá. A cliff with mysterious petroglyphs which resemble a message in unknown writing. A site of legends. Friendship Bridge (Ponte da Amizade) – Alto Paraná and Paraná, Brazil. This 552.4 m long road bridge has an enormous arch whose span is 290 m. Built in 1960 – 1965. Itaipu Dam – Alto Paraná and Paraná, Brazil. 7,235 m long and 225 m high dam, the largest hydropower plant in the world regarding the annual capacity. Constructed in 1970 – 1984. The artificial lake drowned the largest waterfall in the world – Guaíra Falls. Manzana de la Rivera – Asunción. A historical city district, now serves as a cultural district of the capital of Paraguay. Includes nine historical buildings, where the oldest is Viola House from 1750 – 1758. Palacio de los López – Asunción. Magnificent government building in Neo-Classical style, built in 1857 – 1867. 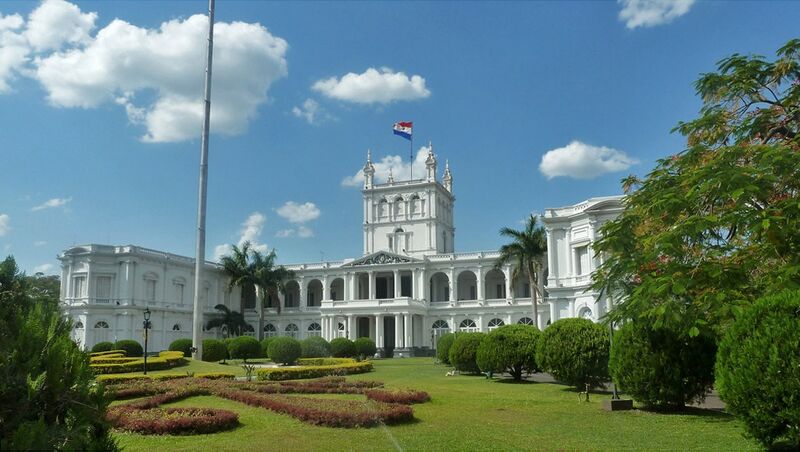 Built as private residence – palace for Francisco Solano Lopez Carrillo, the second president of Paraguay. Panteón Nacional de los Héroes (National Pantheon of Heroes) – Asunción. The construction of this Neo-Classicism building started in 1863 (intended as a chapel) but was finished only in 1936. Now it serves as a memorial site. San Buenaventura Church, Yaguarón – Paraguarí. Franciscan church with beautiful, ornate woodcarvings, built in 1640 – 1700. Waterfalls – the beautiful, wide Monday Falls and Ñacunday Falls belong to most impressive natural landmarks in the country. Ruins of Jesuit missions – just like in the neighboring regions of Argentina and Brazil, in Paraguay have been preserved ruins of Jesuit missions. Back in the 18th century these were ornate, unusual, and impressive buildings. Petroglyphs – in South America exist thousands of petroglyph sites but some in Paraguay have a special fame. In such sites as Ita Letrá and Gasory rock shelter the petroglyphs resemble some ancient, undeciphered writing. This has given a birth to some pseudoscientific theories about ancient Vikings or Celts coming here. Anywhere else in the world Monday Falls would be a major tourist attraction. These 45 m tall and approximately 120 m wide falls are truly breathtaking – but here they are overshadowed by the 24 km distant Iguazu Falls. The new edition of the first and still most comprehensive guidebook to Paraguay in English is engagingly written by a long-term resident. Paraguay is an emerging tourist destination, rapidly improving its facilities but still mercifully free from tourist tat. 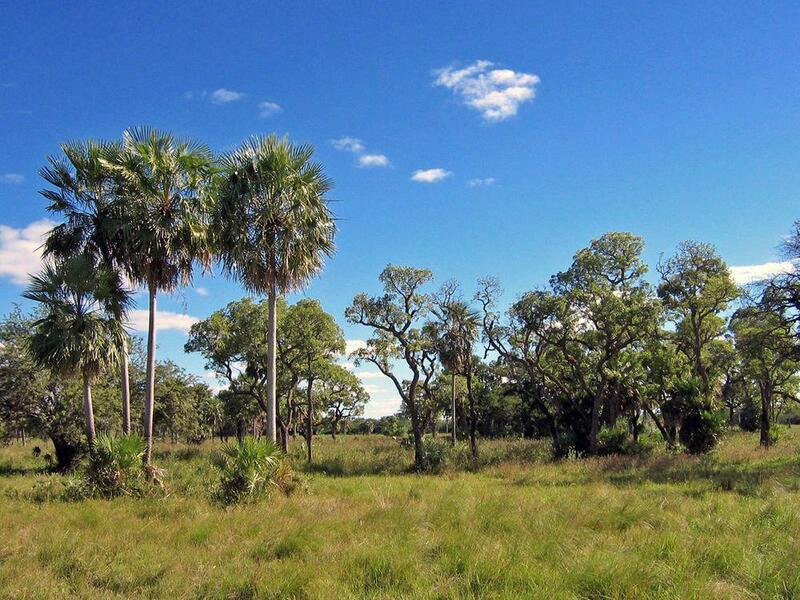 You can explore savannahs dotted with palm trees, red-earth roads, empty river-beaches, damp Atlantic forests, or the wild Chaco’s ‘green desert’, all without running into another foreigner. You can swing in a hammock chugging slowly upriver, and enjoy some of the best bird-watching in the world. Folk dance, harp playing and handicraft – particularly in sewing – are vibrant, living traditions.